Slice off the top of the tomato. Hollow out each tomato using a spoon, and save the core for later. In a frying pan, combine the ground beef, garlic, red pepper and chopped green olives. Incorporate the tomato cores that were set aside earlier. Season the mix with oregano, salt and pepper. Once the meat is fully cooked, fill each tomato with the mix until stuffed. Cover with shredded cheese and bake the stuffed tomatoes for about 10 minutes. Serve immediately. Try adding other vegetables to the ground beef filling, such as mushrooms or carrots. Ground beef is always handy in a pinch; it can be paired with an infinite number of ingredients to make many different dishes. 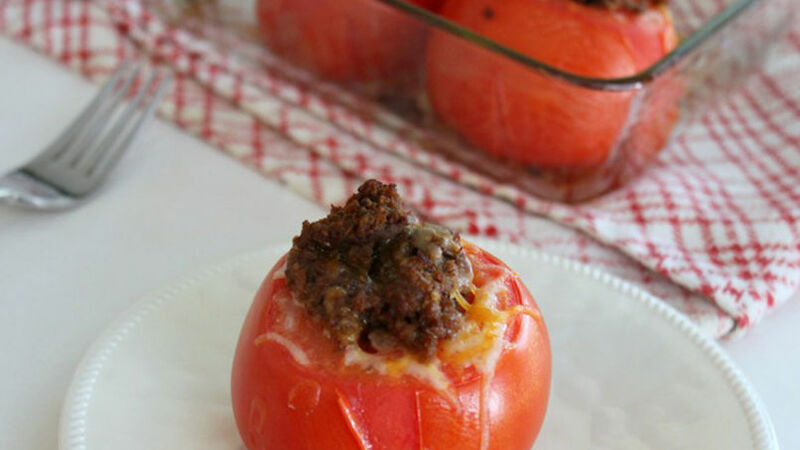 One of my favorite recipes combines ground beef with vegetables and seasoning, served as a filling for juicy, ripe tomatoes. Shredded cheese adds a special touch, and the final product is so rico, it can be served as an appetizer or as the main dish. Be inspired by your imagination, and add in or substitute your favorite ingredients to make this recipe your own. The possibilities are endless!